Magic Shot Prize Redemption Arcade Machine is an exciting game of skill from Andamiro. This prize redemption game is 100% based on user skill and the eye level play zone gives players the confidence of winning. 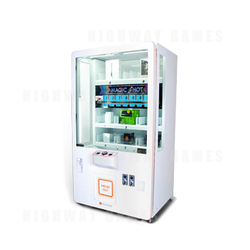 The cabinet is sturdy, brightly lit with LED lighting, has adjustable prize bins of various sizes with anti-theft protection and based on the iPhone design. If the "S" successfully passes through the hole you win the prize!